This here is Xipe Totec, Aztec god of sporks, Cajun food (I don’t know) and SATA cables (that’s right, the Aztecs had computers, and they preferred AMD). 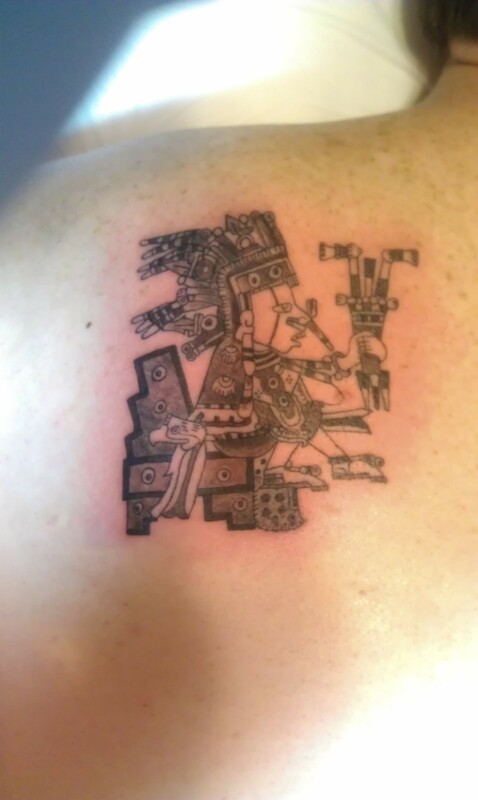 That’s all fine and dandy, he appears on my back because he is also associated with life, death, and rebirth. I consider my experience with brain surgery that kind of cycle – life = uhh, being alive; hemorrhage = death; surgery = rebirth. 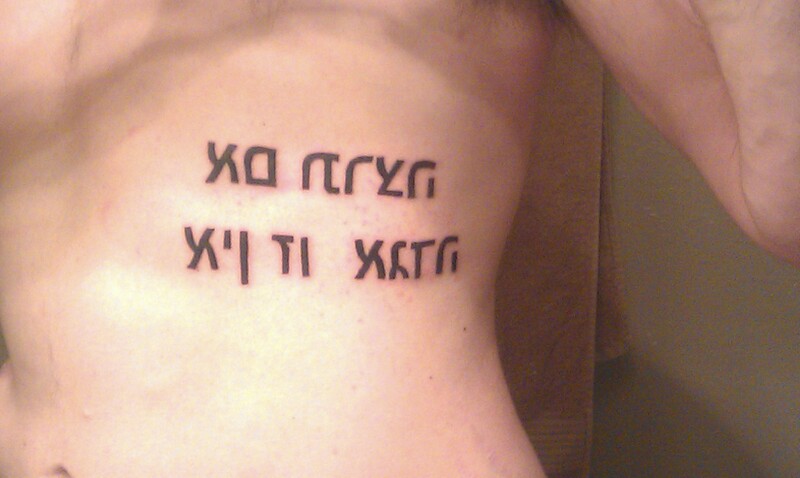 This next ink is Hebrew for “holy sh*t, please stop. I’ve changed my mind.” Actually, it says “If you will it, it is no dream.” These words are credited to Theodor Herzl, an instrumental figure in the establishment of the state of Israel. I’m familiar with it because of Walter Sobchak – John Goodman’s character in The Big Lebowski – the greatest film ever made (view it here). I chose this because I love the movie (obviously), and I got to a point in my recovery where I thought this is it, the Jarrett that is now is the Jarrett that will always be. In a way, that’s like giving up; I needed a permanent, extremely painful (seriously, tattoo on ribs = same class of ouch as shots in the foot(!). I thought about getting surgery to become an android, but the doctors tell me they can’t do that yet (amateurs!). The only other option was to get a tattoo. 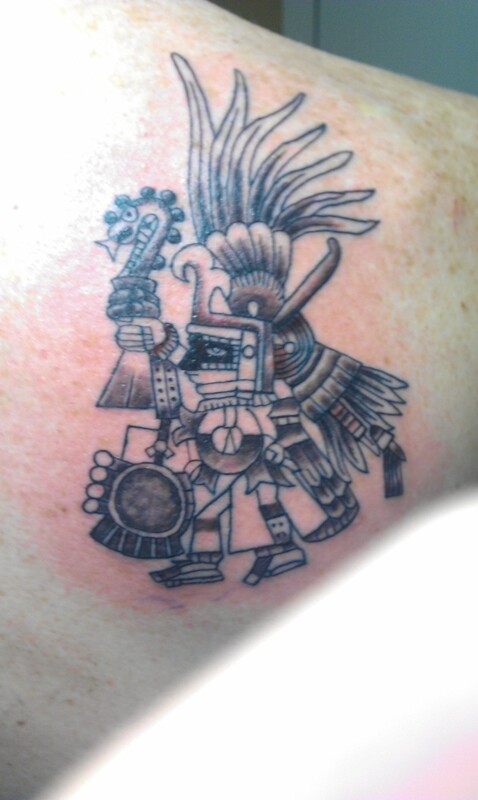 The newest addition is Huitzilopochtli – Aztec god of peanut butter and jelly sandwiches, air mattresses and staplers. He is also the god of journeys, I couldn’t find anything for god of injourneys (damn you, Wikipedia! Why have you forsaken me?). Being the politically correct liberal that I am, let me go ahead and say that my descriptions of the gods were not meant in any way to disparage or insult the Mesoamerican culture. 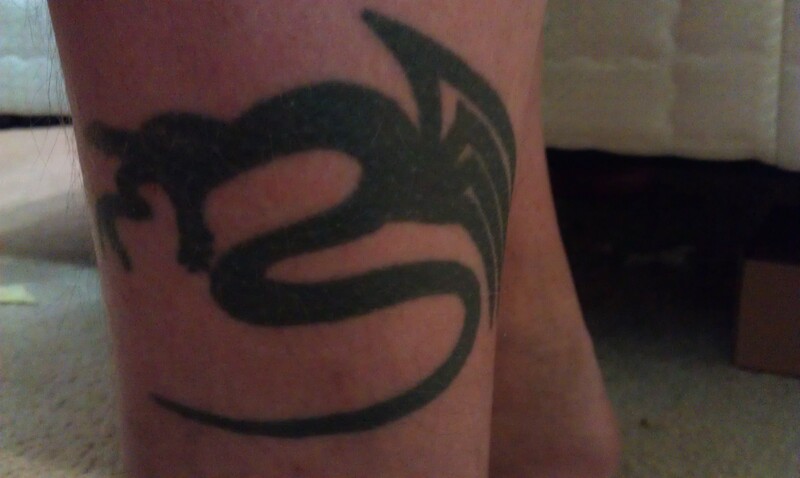 I’ll start with my very first tattoo – a dragon on my ankle. 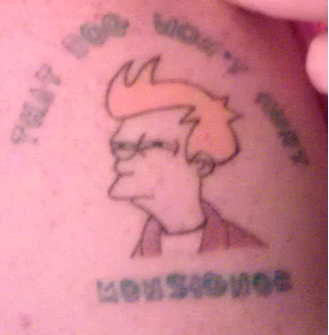 It represents my fiery hot zest for life. That’s a lie. It represents “I’m 18, have graduation cash to burn and happen to be in Dallas”. Do I regret it? Yes and no. I don’t think it’s ugly, but I hate the fact that it has no real meaning and it occupies an easily concealable tattoo spot. I know the image is a popular MEME, and it has been mistaken as a MEME, Futurama and I go back a ways, so it’s oh so much more than an overused picture and a clever saying. To prove it to you, I can tell you that the line was uttered (“that dog won’t hunt, monsignor”) by Fry after learning that he doesn’t get the military discount on his ham flavored gum (which turned out to be all bones) in “War is the H-Word” – eighth episode of the second season (not too sure on the season, but the rest is accurate). A few months ago, I started a serial (mmm…serial) called “”Timesavers””; one set of quotations is to denote that it’s a title, the other set is to show that, though they are conceived in my mind as saving time, they really make me seem crazier and prodigiously nit-picky. I had a “time-saving” episode on Saturday morning so desperately nit-picky that I just had to share it. I tried to make it a TBI is…, but Torange Buice Iroutine is a bit confusing. My Words Shall Now Be Pressed! Great post ! You are just so clever!